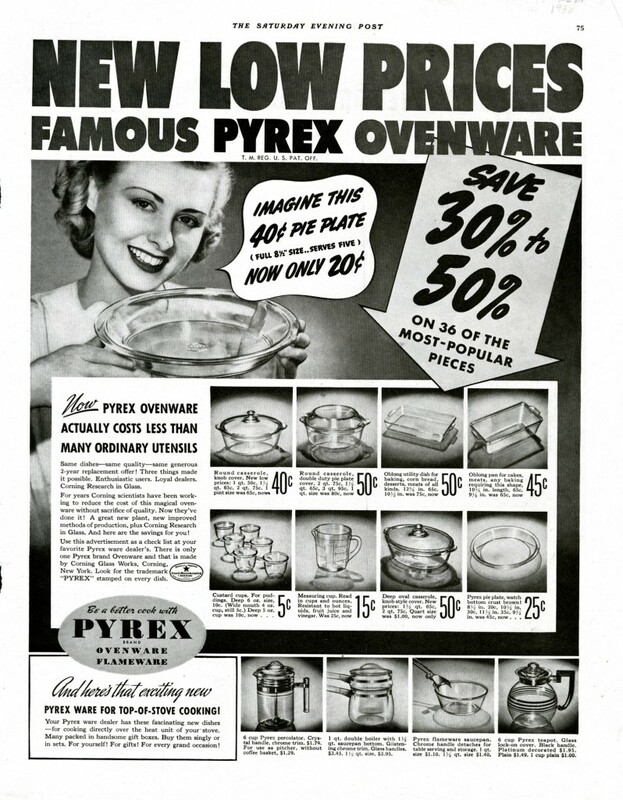 In the beginning, Pyrex was marketed as a luxury item and sales were strong. But in the mid-twenties Pyrex sales stagnated. To find out why, Corning Glass Works began a partnership in 1925 with J. Walter Thompson, a major advertising and marketing agency. J. Walter Thompson conducted an in-depth investigation with dealers and consumers in southern New England, eastern New York, and southern Ohio. Based on the results, J. Walter Thompson drew a couple of conclusions. 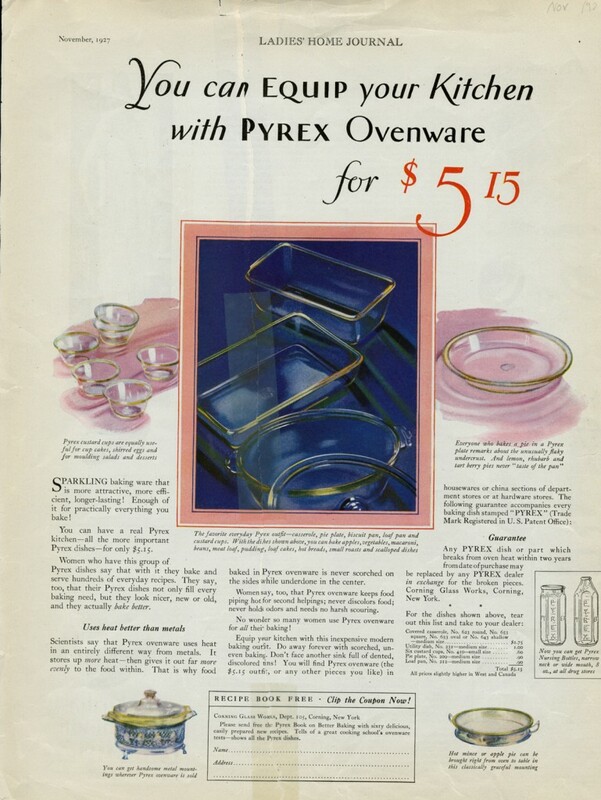 First, it appeared that Pyrex advertising was reaching people; the reason for stagnating sales wasn’t lack of advertising. Second, the survey showed that people found Pyrex too expensive—a luxury item more suitable as a gift rather than used for everyday cooking. J. Walter Thompson recommended cuts to the Pyrex line of 39 pieces to lower manufacturing costs. The second recommendation made was about the marketing of Pyrex. They also suggested that marketing a set of everyday dishes could lead to stronger sales. The result: a kitchen set of everyday Pyrex for $5.15 sold through department stores, helping the public see Pyrex as more than just a luxury product. These changes helped to stop the declining sales of Pyrex, but the product line did not see much growth in sales. J. Walter Thompson again brought up steep manufacturing costs passed on to the consumer through high prices. Corning worked on bringing down costs and by 1933 all production of Pyrex was fully automated, reducing the price of products by half. J. Walter Thompson also suggested that glass would always be novelty unless it could be used on top of the stove as well as in the oven. 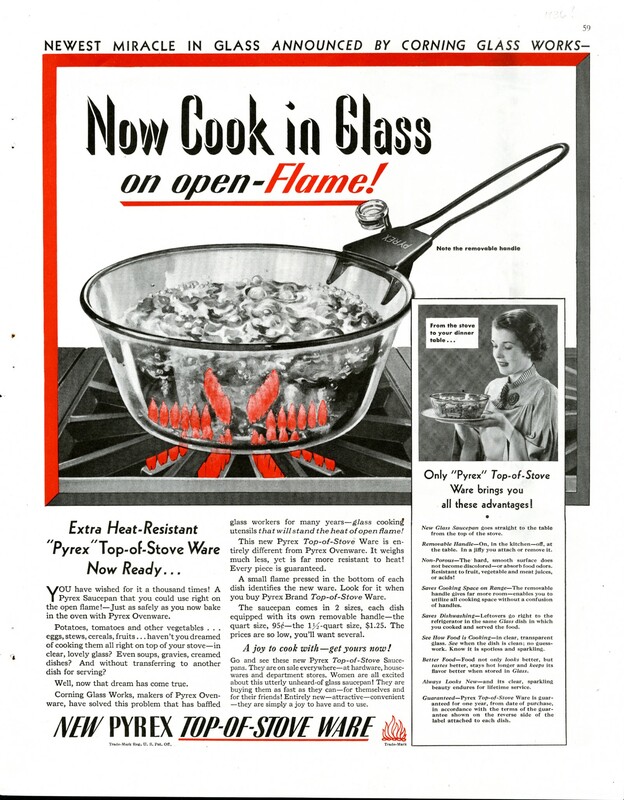 Corning began working on a top-of-the-stove product and by 1936 had developed Flameware. Corning Glass Works. Now cook in glass on open-flame, April 1936, published in Good Housekeeping.